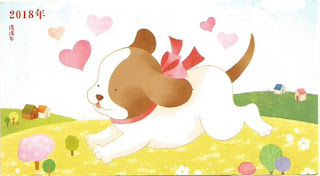 A lottery greeting postal card for this year, Year of the Dog 2018. The ID no. is HP201801. Thanks tang_tang. Two stamps were used to up-rate this postal card that comes with an 80 Fen imprint stamp of Year of the Dog. They are 3 Yuan vase (2013-9, 6-6) and 1.20 Yuan Guangxi ancient city view (2016-12, 6-6). A postmark from Zhejiang Suichang Fengfa 1 (浙江 遂昌 封发1) cancelled only one of them on 1.3.2018.